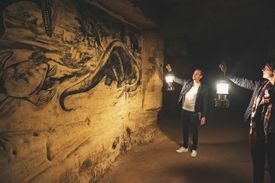 Through a labyrinth that once comprised more than 20,000 corridors, a professional guide takes you underground to see the names and drawings of people who worked here every day a few hundred years ago. The manual labourers who cut out the blocks as well as various artists have left their marks, including various interesting and sometimes very old inscriptions on the wall. In a labyrinth that once comprised more than 20,000 corridors, a professional guide takes you underground into the 80-kilometre-long cave system called ‘Grotten Noord’ (North Caves). The site's unique attractions include the dome, the place where residents of Sint Pieter sheltered, and the safe. Maastricht's cultural heritage goes deeper than the eye can see. Underground, still more historical treasures await. Go back in time, enter the darkness, and let your imagination wander as you listen to the stories of Maastricht Underground. Maastricht Underground is the collective name for everything there is to see and experience in Fort Sint Pieter, the caves, and the Kazematten underground tunnels.